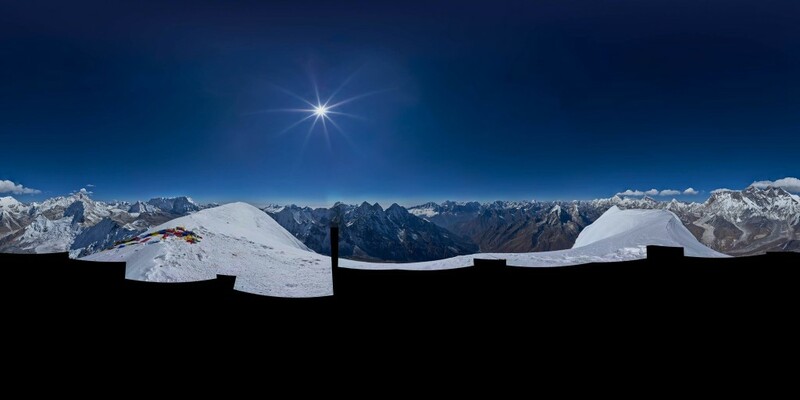 Here’s the one you’ve all been waiting for – a 360º x 180º interactive summit panorama from the top of Ama Dablam. It’s really cool on a smartphone … but if you have the time and inclination fire up your laptop and have a look in high resolution with all the surrounding peaks labelled. Honestly … it’ll be worth it. Not only did this involve summiting the fine mountain at the end of a 4 week expedition with all the hardship that is involved in Himalayan mountaineering but, when I took the 350 photos needed, I got through 5 batteries due to the cold. This obviously got me in to a bit of a panic and I ended up missing a crucial overlap (see the photo. In fact why not click the photo?). Thankfully I backed up the whole project with some summit video and Thomas was then able to reconstruct the crucial missing bits. Ama Dablam 360º x 180º summit panorama. Click the photo to see the finished result. When you consider the challenge that Thomas Worbs of Mountainpanoramas was faced with it makes it all the more remarkable just what a great vista this is.